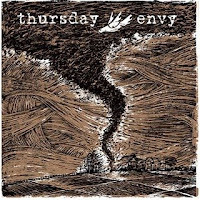 To say that I’d been waiting for this with baited breath would be an understatement: Envy are simply brilliant and Thursday have always held some favour with me, even through the rocky A City By The Light Divided years. Spine-chilling album artwork and a seven-track listing of names far too long to be functional led me to a glorious conclusion: this was to be, on paper if nothing else, something new for Thursday and something typical of Envy. As He Climbed the Dark Mountain confirms any thoughts of a new outlook on the part of Thursday: faced-paced, technical riffing intertwined with expeditious drumming makes Rickly’s trademark rasp stand out more than ever. It’s raspy again: it seems that they’ve left behind the post-production excesses of their most recent work and it really is better for it. Track two of Thursday’s four is the somewhat more experimental In Silence. With an introduction smacking of the likes of Jesu with its synthesiser-meets-droning-ambiance-of-guitars dynamic. This is like no other Thursday song released before: it’s fully instrumental and borders upon the definition of musically ‘epic’. It wondrously leads from the aforementioned droning amidst synthesisers into a piano chord-bashing exercise, only to rise again to the heights of a tremulous soundscape almost aping the work of Godspeed You! Black Emperor. An Absurd and Unrealistic Dream of Peace begins hauntingly: barely audible piano and guitars raise hairs which are only to be flattened seconds later by the violent progression of distorted guitar chords to come. Once again fast and technical, the instrumental work here is beyond simply ‘impressive’, it’s standard-setting for bands within Thursday’s peer group. Appeared and Was Gone is another instrumental song, this time with piano leading a march into the deepest of electronic noise experimentation: we climax with nothing short of sonic cataclysm. This is not typical Thursday: this is an evolved, matured Thursday; somewhat ironically looking back to their earlier works of Waiting and Full Collapse for inspiration. Envy’s half of the split is just as impressive. An Umbrella Fallen into Fiction is as progressive as anything by Envy: a four-minute, low-key introduction mixing electronic and ‘real’ instrumentation with the soft-spoken monologue of Tetsuya Fukagawa leading to a passionate explosion of screams amidst a background of swirling guitars. And it still works. It’s still surprising. That guttural, visceral exhalation is still as passionate as it was on Breathing and Dying in this Place. Isolation of a Light Source is more direct: the pretext of an introduction is done away with and immediacy takes its place. Divine riffs cross with incomprehensibly quick drumming to form a whole which embodies the spirit of the band’s music: technical, whilst not devoid of feeling; the anguish in Fukagawa’s voice is truly discernible. Pure Birth and Loneliness takes a step back in terms of tempo, whilst providing the same softly-spoken and tremolo picked delights of Japanese rock, as well as the throat-exercises so resplendently executed. Nothing is an excess: it’s all essential, from the scream-talk dichotomy to the soft-hard ascensions of instrumentation.